HUNT Dimming, the Fort Collins, CO-based lighting controls manufacturer, has unveiled an enhanced version of its popular Custom LCD Touchscreen series of controls which incorporates new daylighting features. The Simplicity™ Series LCD Touchscreens provide features complementary to the existing monitoring and control found in HUNT’s microprocessor-based dimming panels when used in Daylighting applications. 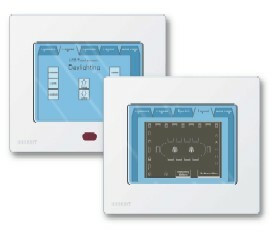 Designed to overcome on-site language barriers and simplify ease-of-use, HUNT’s LCD Touchscreens provide visual and intuitive digital lighting control for single location operation, monitoring and programming of all lighting zones, while communicating in a user-friendly format optimal for a diverse set of users. Options for making daylighting adjustments include graphically depicted program screens utilizing customized AutoCAD® layout drawings. Daylighting program features may alternately be accessed and displayed in foreign languages or with international symbols, overcoming on-site language and communication barriers between a diverse set of potential users. Complementary Simplicity™ Series wall-mounted control stations include pushbutton control stations that provide flexibility and control through pre-programmed and field changeable functions; and, handheld infrared remote controls. HUNT’s Simplicity™ Series 12 Circuit Digital Dimming Panels are the industry’s smallest, lightest-weight, convection-cooled dimming panels. Each dimming module is rated at 20A and is multi-rated to control incandescent, fluorescent (phase-control), low voltage (electronic or magnetic), neon, cold-cathode, fan-speed and non-dim (or switched) sources. Panels are available in either 120V or 277V ratings, and are UL and cUL Listed. For more information about HUNT Dimming, visit www.huntdimming.com.